Neither a soap nor a shampoo! 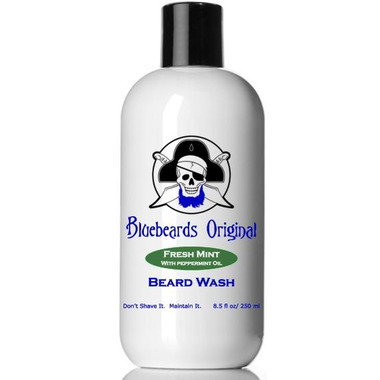 When used on the beard, traditional shampoo can dry the skin underneath; facial soap leaves sticky residue behind. That’s why Bluebeards created their Beard Washes, which gently cleanses both facial hair and the sensitive skin underneath, leaving both beard and face clean, soft and smelling great. This Fresh Mint Beard Wash will leave your beard clean and soft. Real peppermint and menthol stimulate your skin and add shine to dull facial hair. Amino acids lock in moisture and condition the beard. Directions: Wet face and neck. Place a small amount of Beard Wash on tops of fingers and massage into beard and face using a circular motion. Rinse beard throughly. Can use daily. My husband loves this product! He is very sensitive to smells and his skin will break out...but not with this product. I actually live overseas and have this product sent to me by my family ~ we think its that good. His father tried it once and now he is hooked as well.